Love to travel but find your guitar is just too big to take along? In this intensive week-long workshop, you’ll build the perfect-sized instrument to join you on your journeys. All materials provided. 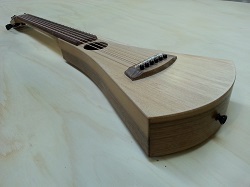 Over one week, guided all the way, you’ll take some slivers of timber and craft them into components of a “backpack” style travel guitar and assemble them into a finished instrument – steel string or nylon string, you choose. The workshop will teach you the fundamentals of building an acoustic instrument and leave you with a completed guitar to take home (and away!). The course will be combined with the “Ukulele Making Workshop” (with some participants making the guitar and others the ukulele) and is limited to 12 enrolments (with a minimum of eight needed to go ahead). No previous woodworking experience is required. All materials are provided but bring lunch and a cup for coffee, a pencil, eraser and notepad and a camera if you want to record the process. Please wear clothing and footwear suitable for a workshop environment. Parking is available at the High School.